I did like "The Men Who Stare at Goats", however, it was not as good as I set my hopes for. This is one of those movies where the trailers and adds on television showed the funniest parts of the movie. The story was neither here or there and I spent a majority of the time hoping they would really go somewhere, yet it never did. I felt that the idea of the movie was very splendid, but the execution left a lot to be desired. Clooney and Spacey were great as always. Bridges (who I am not quite as familiar with) was enjoyable as well. McGregor was not bad, yet nothing special. Overall, not bad acting, not bad ideas, but the story could have been better. Check it out if you have a chance but don't worry if it passes you by. The advertising poster is a spoof of a frequently used style for movie posters. Instead of trying to communicate anything about the plot or content of the film, it just contains multiple stacked faces of the stars. 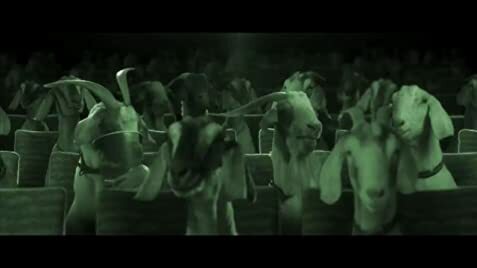 On this poster the last face visible in the row is a goat's, and the billing line above their photos reads, "George Clooney, Jeff Bridges, Ewan McGregor, Kevin Spacey, and Goat." It's also a reference to the iconic drawing posters from the Soviet communist era, showing profiles of Karl Marx, Friedrich Engels and V.I. Lenin (in some eras or world regions, often completed by profiles of Joseph Stalin or Zedong Mao). Brigadier General Dean Hopgood: Boone. Brigadier General Dean Hopgood: Damn it. In the 1980s Ft. Bragg was an open post, with no guarded access points.